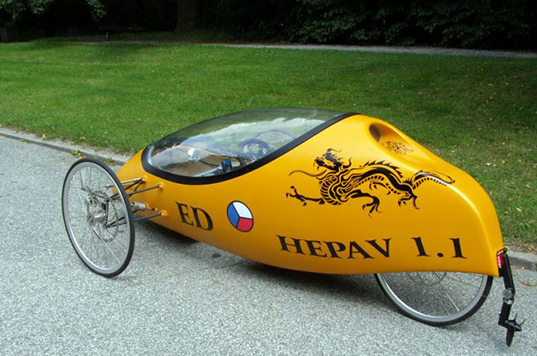 From an ambitious inventor in the Czech Republic, we bring you the HEPAV — the Human Powered Electric Amphibious Vehicle. How does it work? Simply put, the HEPAV 1.1 is a recumbent tricycle with electric assist and a buoyant shell that allows riders to drive directly into and out of ponds, rivers and lakes. Inventor David Buchwaldek says he designed the HEPAV 1.1 to be like a kayak in that it can be transported by vehicle but ridden directly into the water. Video proves the viability of Buchwaldek’s design, but it remains unclear how practical it is. The HEPAV 1.1 seems pretty slow in the water at this point.